I conduct mixed methods research regarding the impacts of stigma, sociocultural norms, and communicative processes on health disparities, the social determinants of health, and public health practice itself. 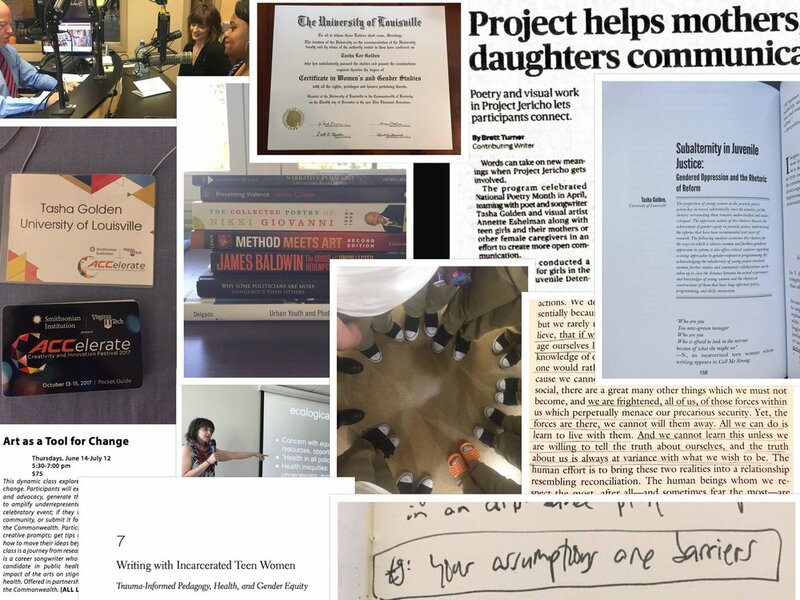 A central tenet of my work is that health equity cannot be realized without ongoing, reflexive innovation toward 1) eliciting and valuing diverse knowledges; 2) increasing research reciprocity; and 3) addressing histories of researcher intrusion among oppressed populations. Based on the sheer prevalence and impact of trauma, adverse childhood experiences (ACEs), and marginalization, I pursue modes of inquiry and practice that can more equitably accommodate individuals and groups whose identities or experiences render participation in traditional studies, formats, and venues unsafe or unfeasible. My dissertation prototyped and evaluated three arts-based methods for researching experiences and perceptions of violence among Louisville, KY females ages 11-21, comparing results to data from quantitative violence-related surveys among the same populations. Results indicate that these prototypes aided disclosure (thus improving data), were time- and cost-effective, supported community-led health education, and offered significant potential for research reciprocity—all with minimal researcher intrusion. As such, they offer promising models for continued methodological innovation in advancement of health equity. My work is grounded in research regarding stigma, shame, trauma, ACEs, mental health, and intersectional disparities. I also draw on extensive academic backgrounds in critical pedagogy, Women’s and Gender Studies, Rhetoric, and the arts to develop innovative strategies for research, dissemination, public education, and resource provision. What do researchers miss about a population when our means of communication cannot accommodate stigma or varied abilities, or when they cannot reach across cultural difference—or across trauma? How might over-reliance on limited research strategies actually perpetuate health inequities—by requiring that health, healthcare, and health behaviors be communicated and assessed according to dominant norms? And how might failures to gather more complete knowledge be affecting funding/resource decisions, health care access/delivery, etc? What can we learn about a community's assets, needs, and priorities by observing and analyzing the art that its members create, celebrate, and share?